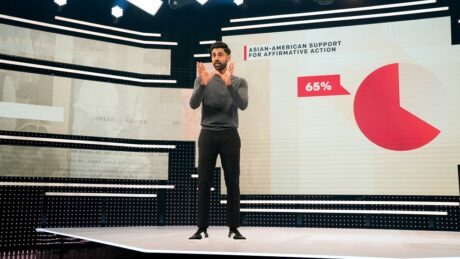 NYC – The Netflix original series Patriot Act with Hasan Minhaj is a media rich, fast changing production that relies on dynamic content to support the theme for each episode. 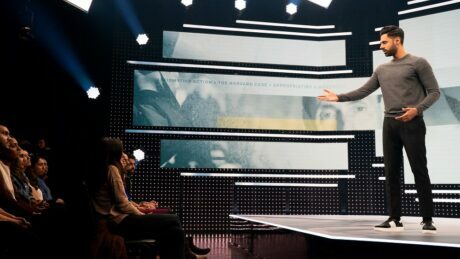 To realize the media heavy set design for broadcast, Production Designer, Marc Janowitz and Producers, Art & Industry, Inc. brought in 5TEN, an LED display design engineering team to deliver the show’s video display systems. Minhaj, a Peabody Award-winning comedian for his Netflix special, Homecoming King and former correspondent for The Daily Show, headlines the original series, which explores modern culture, politics, and global news through his irreverent mix of comedy and storytelling. Each weekly episode uses infographics, data, and video content to enhance the topics he covers. Janowitz, who is known for his concert production designs, also designed Minhaj’s Homecoming King special. 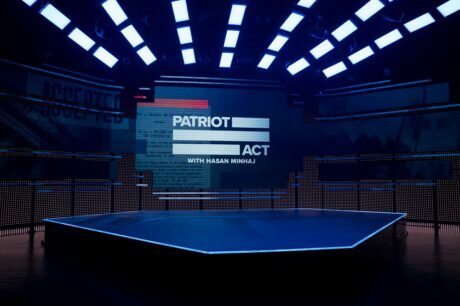 He was brought back to be the production and lighting designer for the weekly Patriot Act series. His design utilizes unique shapes and configurations of LED displays to surround Minhaj in an immersive environment, so careful consideration of display products was key to 5TEN’s level of involvement. The main display is a configuration of an ultra-high-resolution 1.9mm LED video product that also consists of 22˚ concave angled banner displays—with the same 1.9mm product—connected to the main display and extending out and wrapping the set. The floor of the set features a diamond-shaped LED floor using a 4.7mm LED product covered with triangular-shaped acrylic diffusers. There’s a 25mm LED screen behind the main display along with 10mm diffused LED strips in the backdrop and 14mm diffused LED strips for the floor edge. With the show being so media heavy, fast changing, and extremely dynamic content-wise, “the combination of the disguise 4×4 media server along with Barco S3 image processor provided the optimal solution to deliver the content to the display,” comments David Imlau, 5TEN’s Technical Director. All control and data transfer infrastructure— switchers and routers, LED control processors, monitors and programming computers—for the video elements were also provided and installed by 5TEN.